Northwest Ohio's Most Exciting Big Band! Night Session is made up of a diverse group of musicians from the Northwest Ohio and Southeast Michigan area. Click here for more information about the members of the band. We'd love to play at your next event. Click here for ways to contact us. Want a sample of how Night Session sounds? Click here to listen to a few tunes from our song list. A full instrumentation big band, Night Session's professional musicians are committed to musical excellence. For more information about the band, click here. For more information about the musicians in Night Session, click here. We promise to excite your guests and bring a memorable evening you and they will talk about for a long time! "Night Session Big Band can really swing! ...No one leaves the dance floor when Night Session is playing!" 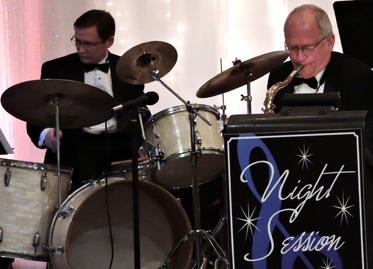 "After every Big Band at the Bay event at Maumee Bay Lodge, guests tell us how much they enjoy the music from Night Session." "What a great sound Night Session delivers, not to mention the following they bring to our venue."